This is part 2 and the conclusion of my talk with Dr. Lodge McCammon the author of Schooled: The Story of An Education. If you haven't heard part 1, go to episode 190. Lodge is a return guest who is always great to talk with. If you haven't heard our earlier talks go to episodes 10, 11, and 54 to catch up. Schooled: The Story of an Education is Lodge's memoir. 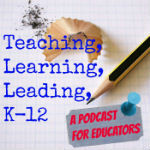 He shares his thoughts about his experiences with learning and what the world taught him about himself and education. His stories are inspiring and thought provoking. His gift for writing makes you want to know more. Join us as we talk about lessons from his past and what he learned about creating student engagement in the classroom.